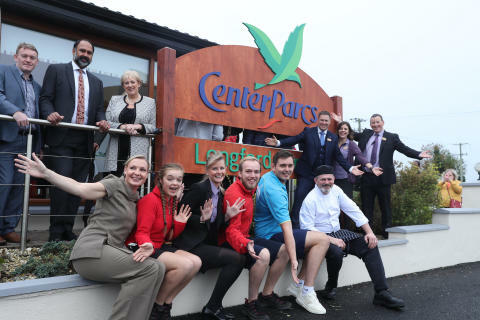 11.00am, Friday, 12th October 2018: Thousands of job seekers attended the first of Center Parcs’ recruitment information days in Longford today, officially opened by Minister for Business, Enterprise and Innovation, Heather Humphreys, T.D. Senior management from Center Parcs were delighted to welcome a large number of potential employees to hear about the recruitment process for the much anticipated 1,000 permanent roles being created in the Midlands by the company.The new €233m Center Parcs Longford Forest resort is due to open in summer 2019. Prospective job candidates were invited to meet and engage with a 30-strong team of current Center Parcs employees hailing from all parts of the business and its five successful resorts in the UK, including a significant number of senior management figures and the growing Irish management team. Attendees learned, for example, what it will take to become a Lifeguard at the Subtropical Swimming Paradise, which will be Ireland’s largest indoor swimming complex heated to a balmy 29.5C all year round and complete with water rides for all ages, or what’s involved in being a Forest Ranger taking care of the beautiful 400-acre woodland in which the resort is situated. Delivering an amazing guest experience at Center Parcs Longford Forest will require a large complement of staff with a huge breadth of general and specialist skills. The jobs on offer represent all segments of the Center Parcs business including food, beverage and retail; leisure; housekeeping; technical services and support roles. The roles on offer range from an accountant to a bus driver as well as, chefs, receptionists, beauty therapists, lifeguards, baristas, bike mechanics, water sports assistants and climbing instructors - to name just a few. Opening the recruitment days, Minister Heather Humphreys, said: “It is fantastic to see the Midlands benefitting from the influx of an unprecedented 1,000 jobs. I have been struck today by both the enthusiasm of the candidates and the commitment that Center Parcs demonstrates to hiring good people and developing great lifelong careers for them. Today is a special day as we are witnessing not just the vast economic impact that Center Parcs will have, but the even greater social impact. When complete next year, the €233m Center Parcs resort will offer 466 lodges and 30 apartments to accommodate 2,500 guests.During a Center Parcs short break, guests can enjoy more than 100 indoor and outdoor family activities, including the legendary Subtropical Swimming Paradise, and a range of restaurants and shops.The development has created over 750 jobs during the construction phase and when operational, the village will employ up to 1,000 people in permanent jobs and provide a €32m boost to the economy. Center Parcs is the leading provider of high quality family short breaks in the UK, offering weekend or midweek breaks in a secluded and natural woodland setting. Center Parcs Longford Forest in Ireland is expected to open to guests in 2019. The company currently operates five short break destinations across the UK*: Whinfell Forest, Cumbria; Sherwood Forest, Nottinghamshire; Elveden Forest, Suffolk; Woburn Forest, Bedfordshire and Longleat Forest, Wiltshire. Center Parcs regularly achieves average annual occupancy rates in excess of 97% and welcomed two million guests last year. Following an announcement in 2015 of its intention to develop a forest holiday Village in Ireland, Center Parcs successfully secured planning approval to invest €233m in the development of a forest holiday village on a 400-acre site in Newcastle Wood, five kilometres from Ballymahon in County Longford. The development will create approximately 750 jobs during the construction phase. When operational, the village will employ up to 1,000 people in permanent jobs, with the majority of employees likely to live locally. Center Parcs Longford Forest will have capacity for up to 2,500 guests. Center Parcs estimates that, when operational in 2019, the new holiday village will add approximately €32million to Irish GDP per annum and €1bn over the next 20 years. The construction phase is likely to last up to two years and the village is expected to open in 2019. Center Parcs awarded its first major contract in Ireland to Limerick based Roadbridge Civil Engineering & Building Contractors in March 2017 to undertake key infrastructural development works. The infrastructure contract comprised the earthworks, road and path networks, utilities, drainage system, the lake and building platforms. In December 2017, Dublin based construction firm John Sisk & Son was awarded the contracts for the construction of the lodges and apartments as well as the state-of-the-art centre buildings – housing the iconic Center Parcs Subtropical Swimming Paradise, restaurants, bars and shops and moved on site in January 2018.
the Subtropical Swimming Paradise, with water rides and fun for all ages. Over the last 30 years, Center Parcs has exhibited a proven track record of taking commercial woodlands and, through careful forest management, transforming them into areas rich in biodiversity.Center Parcs Longford Forest will have a dedicated team of Conservation Rangers who will protect and nurture this beautiful woodland. *Please be advised that while Center Parcs UK and Ireland and Center Parcs Europe, share the same name and logo, they are two separate companies. Our vision to bring new and unique family breaks to Ireland is now becoming a reality, with Longford Forest set to open its doors in summer 2019. Our forest resort, at just under 400 acres in Longford Forest will include 470 luxury lodges and 30 stylish apartments which will accommodate up to 2,500 guests in a safe, peaceful, and car-free environment. Our guests will be able to enjoy more than 100 family activities – both indoors and out – a range of restaurants and shops, and our famous Subtropical Swimming Paradise, which will be Ireland’s biggest and most impressive water park ever. Something to do for everyone in the family, whatever the weather. With miles of beautiful forest to explore, guests will choose how to spend their time – filled with activities or simply taking life slowly and soaking up the beautiful surroundings. Prior to publication, it must be approved by Center Parcs Ireland .